The time had come to complete the big tastings with the third giant. After having had big tastings with both Ardbeg and Port Ellen, I felt I had to arrange a Brora tasting too. The first 10 Annual Release (2002-2011) were of course going to be in the tasting and then they would be complemented by 14 Independent bottlings and one Rare Malts. The tasting was, as expected, quickly fully booked and during the year we waited for the autumn to come I managed to get hold of a Masterpiece to spice up the tasting. A bottle of Brora 1972, 22 years old, Rare Malts, 58,7% appeared in an auction and I managed to buy it. It cost 18.000 SEK! A sample of it was offered to the participants at the tasting and almost everyone took the chance to try a legendary bottling of Brora. We started the tasting at 13.00, so we would have plenty of time to enjoy this beautiful nectar. To see 26 bottles of Brora was a lovely sight and the aroma that spread in the room when the glasses were being poured was fantastic. I had decided to have the best ones, which means the Annual Releases as flight number 2, so we started the tasting with 8 different Brora's from Independent bottlers. All of them were distilled in the 80's, so there was a bit of a mini theme for the first flight of the day. This flight turned out to be the worst of the day. No fantastic ones but no really bad ones either. I gave them 82 to 87 points. We all know that 80's Brora is far from 70's Brora, so we all knew that the day would be better than this. After the first flight we had a food break for an hour and then we were ready for some more whisky. Now it was time for the Annual Release flight. I took out the 25 year old though, as I wanted the flight to be just 70's Brora, so I lined up the eight 30 year old, the 32 year old and I also included the 1972 Rare Malts in this flight. It was tasted last in the flight. Now we all got to experience the magic of Brora! 10 fantastic whisky experiences each on their own, but together like this made it an insane flight. The Annual Releases all got 90-93 points from me (yes, I know I'm being cheap here) with the 2004 release as my personal favourite. The Rare Malts 1972 did beat them all with its 95 points. I couldn't resist the temptation to spice up this flight a bit more, so I had some personal samples of Brora with me, 1972, 31 year old, 221 bottles, Douglas Laing Platinum, 49,3% and 1975, 20 years old, 20 cl bottle, Rare Malts, 60,75%. With these two I had 12 different Brora's from the 70's in the same flight and all got 90 points or more. The total winner for me was actually the DLP 1972, 31 year old with its 96 points. I do love that peat and sherry combo! Now it was time to dig in on today's buffet and make sure to get food, water and coffee as we had one more flight to go. Another eight 80's Brora were waiting to finish off the day and this flight was a lot better than the first one, so we had a great ending of the day. My Old Malt Cask favourite 1982, 23 years old, Cask 2294 showed it's muscles and won the flight with its 92 points, but just behind it came my favourite The Bottlers, the 1981, 19 years old, Cask 1076 with 91 points. The 1981, 26 years old , Cask 1520 from Signatory also got into the 90's with its 90 points. The Dun Bheagan bottlings were jumbo with their 82 and 85 points and the last three got 88-89. 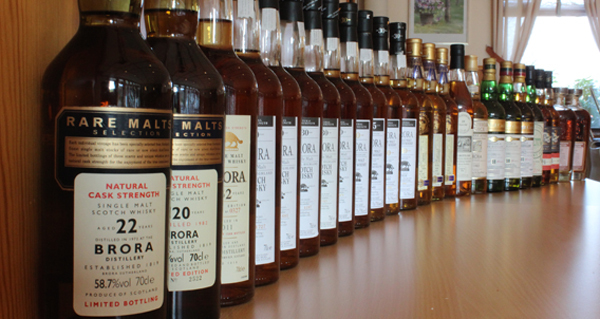 A fantastic Brora day with some amazing whiskies had ended but the memories will live on for a very, very long time.